Rules are catching up to increased use of aerial devices. While they may go by several monikers, such as unmanned aerial vehicle (UAV) or unmanned aerial system (UAS), the word “drone” has been adopted in contemporary vernacular and encompasses a wide variety of designs and sizes ranging from a few ounces up to 55 pounds for civilian uses. The Federal Aviation Administration (FAA) estimates that the total number of commercial and recreational drones in the U.S. in 2016 was 1.1 million. That number doubled in 2017 to 2.2 million, with the increase expected to continue as the public and industry find new applications such as aerial photography, video, mapping, wildlife monitoring, agriculture, infrastructure inspections and search-and-rescue. The list is growing. Aug. 29, 2016, was a game-changer for drone owners when the FAA released new regulations specifically for drones. Previously, drones were considered “aircraft” by the FAA and as such were regulated under a mishmash of existing traditional aircraft rules requiring commercial drone users to apply for various waivers from those aircraft-centric rules. The new rules simplified things greatly by creating two categories of users: recreational or nonrecreational (meaning commercial, civil or public use). Nonrecreational (commercial) pilots now operate under Part 107 of the federal aviation regulations and are required to be licensed and follow stringent operating rules. On the other hand, recreational or hobby users have very few restrictions, but the FAA furnishes several guidelines for flying safely in our increasingly congested airspace. All pilots, especially newer ones, should be familiar with those guidelines and understand that it’s an aircraft they’re launching, not just a toy. As a recreational pilot, here is what the FAA wants you to know. • There is no pilot license requirement. • Fly the drone below 400 feet and keep it in sight (visual line-of-sight). • Be aware of any state and local laws regarding drones. • Notify airports if you are flying within 5 miles of the airport. Depending on the size of the airport, you may not get permission. • Be aware of other airspace requirements. Know the “No Drone Zones” and other areas in which you cannot fly your drone. This includes flying in areas with TFRs (temporary flight restrictions) such as Washington, D.C., or near other aircraft, or in restricted airspace, such as at stadiums, airports, wildfires, etc. • Give way to other aircraft. • Do not fly over stadiums or sporting events. • Do not fly over groups of people and respect the privacy of anyone on the ground. • Do not fly near emergency response efforts such as fires or search-and-rescue operations. • Do not fly carelessly or recklessly with your unmanned aircraft — you could be fined for endangering people, property or other aircraft. 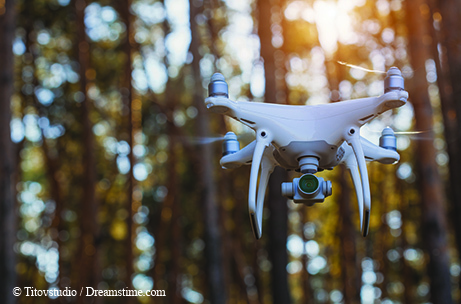 Additionally, there are some common-sense considerations for drone owners, especially when operating around wildlife and in public spaces. • Do not fly over designated wilderness, primitive or other public areas where people seek the solitude and quiet those areas provide. • Unless involved in research or management, do not fly at a low altitude near wildlife, especially animals in breeding or nesting environments.